That’s how I feel about Rochas Audace. On paper, it reads like a strident jumble of notes. On skin, it works. Audace is both crisp and warm, piney-green yet floral with a breath of moss and hint of powder. It’s old fashioned in the modern way Myrna Loy is old fashioned. It’s my new winter favorite. Audace’s notes include bergamot, juniper, galbanum, rose, jasmine, orris, carnation, violet leaf, jonquil, oakmoss, pine, patchouli and amber. 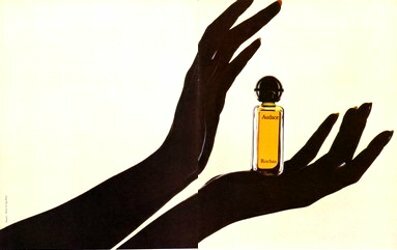 It was one of a trio of perfumes offered for sale at the couturier in 1936 (the others were Air Jeune and Avenue Matignon; see image below) and was taken off the market when World War II began. Rochas re-released Audace in 1972, but discontinued it again in 1978. This review is of the 1970s Parfum de Toilette and Extrait. Audace Parfum de Toilette launches with aldehydes, citrus and a whiff of fir branches. Just as I’m adjusting to the freshness, sweet amber mutes any hint of manly cologne, and oakmoss infuses the fragrance with an almost leathery feel. But Audace isn’t a Givenchy III clone. A full floral heart gives real curves to what could otherwise be a flat-chested gamine of a perfume. Just the tiniest grain of powder lends elegance. Still, the juniper is there, and the amber continues to warm the fragrance. Audace dries down to a mossy-woody blend that smells like hot rocks in a wooden box. The Parfum de Toilette lasts about four hours on my skin. Audace Extrait is quieter and less sweet than the Parfum de Toilette, and its green, floral core is rich and stemmy. It lasts about four hours, too, and holds on to its floral heart longer than the Parfum de Toilette does. Instead, Audace is the kind of fragrance that would have been a woman’s signature scent. On smelling her coat or scarf, her children wouldn’t say, “This smells like jasmine or rose or Chanel No. 5.” They’d say, “This smells like Mom.” It’s individual, yet of-a-piece. The mainstream market doesn’t seem to make these sort of subtle-yet-present fragrances these days, and I doubt many commercial companies would brave Audace’s blend of juniper, wet flowers, amber, and moss. It’s easy enough to toss together an outfit that doesn’t follow fashion but might show some style. For fragrance, select niche lines and vintage often that play that role. I guess the savviest perfume wearers aren’t always the most fashionable. If you can point to some mainstream yet classic, subtle perfumes with style if not fashion, please comment! Rochas Audace is discontinued and is ruinously expensive online. Keep your eyes peeled at estate sales. What a great idea to review this Rochas forgotten fragrance and thank you for this nice write-up. You know by now what a fan of your writing style and articles I am. But I have to say: I particularly enjoyed the intro in this one. You amped up the suspense and I was about to guess that the street photorapher’s audacity (asking to photograph you) pushed you to look for a fragrance named “Audace” and try it. But I was wrong (again!) and that’s what makes great writing! On the subject of vintage fragrances, I have to say that I am becoming a real skeptic. The juice inside is almost always a hit or miss and even my beloved Mystere de Rochas, which I have stocked up on, is starting to “turn”. What a shame that such beautiful fragrances won’t be tried for their real scent anymore. I don’t think I will ever have the opportunity to try Audace as I’ve made a conscientious decision not to succumb to the Ebay Roulette anymore. So I guess I will live through you vicariously and just dream that I’m smelling Audace for the rest of my life. Thanks again for your beautiful review. Thoroughly enjoyed reading you again. I’m glad you enjoyed the review–thank you! I know just what you mean about “ebay roulette,” and I refuse to play it, too. If I can’t smell, I won’t buy. I was lucky enough to have an older friend who is getting rid of some perfume she bought in the 1970s, and that’s the only reason I was able to try this one. Ericgmd, absolutely agree on Angela’s great writing; her mystery intro works so well! In regards to vintages “turn” my personal bad example is my 25ml of Diorissimo one of the firsts I had; bought back in eighties. During my initial perfumista stage I’ve discovered it hidden in one of my boxes “with old stuff” and? Well, it turned hopelessly bad. I wonder why some vintages stay good and some – turn? I think we should think of having this special vintage swapmeet (of equal value ) and tiny quantities; to try the juices nose-proven and As They Were. So sad! I think some perfumes that are heavier on the topnotes tend to turn faster than others. Delicate florals, citrus-heavy scents, etc., seem especially sensitive to time, heat, and light. Perhaps lady luck has smiled on me but generally I’ve had better luck with ebay than with the department store fragrance counters these days. And even many niche lines are relying too much on those spiky wooden ambers, neutered patchoulis, etc. Yep, so many fragrances nowadays have “no balls” or have them so “artificially enhanced” they don’t smell human anymore. Mixed plaids are the dernier cri! Shrieks aside, it is better to be stylish rather than fashionable. Oh gosh, I’ve never even heard of Rochas Audace. It sounds like a very nice perfume based on your description. I won’t hunt it down but if I come across a mini, I may just snap it up. Thanks for the review! That’s a smart way to go! I hadn’t heard of it, either, until I met a woman who had loved it back in the day. It’s a strange little perfume, all piney, green, mossy, and floral–but subtle, and I like it a lot. Hi! Just checked the $$ of mini. Lending this amazingly witty phrase from Angela they seem to be all ” ruinously expensive”. For ‘beautifully blended, doesn’t draw attention to itself, yet has character’; and ‘mainstream yet classic, subtle … with style if not fashion’ I’d go for L’Ambre des Merveilles. It took me a while to get to know this one. At first it seemed like any vanillic amber. After a while I began to notice how the sweetness, which is normally a sticky, heavy element in an amber, seems to float somehow over the top of the labdanum and patchouli. How can something heavy be made to float like that? It fascinates me. Why doesn’t the sweet accord squash the dry accord? It seems to defy nature. That’s where the character of the perfume lies. L’Ambre also has a ‘clean and simple’ feel that probably appeals to the modern consumer’s distaste of stinky notes like oakmoss or civet. So – not quite in fashion but not out of it either. I’m glad in a way that Audace is ruinously expensive. I know not to even look. It’s so funny that you mentioned this one! When I wrote the review, the one fragrance that stood in my mind as a possibility was Eau des Merveilles. Of course, its sisters Ambre des Merveilles and Claire des Merveilles would be contenders, too. There’s something so understated and classic about these fragrances. The style in all of them is effortless, and that is very appealing. Much as I love and wear many of the Lauder classics – I wore Private Collection today – sometimes they strike me as trying too hard, you know? As much as I like the Lauder classics, they don’t really fit that hard-to-describe subtle but classic “perfume” category, either. Maybe Estee comes the closest, but even that one’s pretty insistent. Great review. It was a bit of a punt but I lucked in on a split a few years ago and I’m so glad I took a chance. It’s gorgeous. I tend to wear it in the Spring when its green floral heart suits the season but I can see where you’re coming from in Winter with that pine-y, resiny note which runs through it. Rochas created some wonderful and very individual scents. Rochas really did hit it out of the park with so many of their fragrances! Having read once or twice of your love of vintage fashion, I could not help but to get visions of George Hurrell or Irving Penn chasing you down the street with you wearing a mix of tartan à la Lacroix or Westwood- vivid imagination I have? Indeed, the mainstream market doesn’t seem to make these fragrances anymore. Even Niche brands have become market-ified. Angela, this was a successful blind buy for me on ebay a few years ago when prices were lower. I’m glad you’ve reminded me to get it out and enjoy! Forgot to congratulate you on the outfit! One of my favorite parts in your books is when Joanna muses about the vintage clothing outfit she’d compose for someone she meets. I’m not sure I deserve a lot of congratulations for the outfit, and I’ve been studiously avoided looking for the photo online…but thank you! Hey, you scored! Do enjoy it! This has been n my radar for ages; one of these days I will splurge! 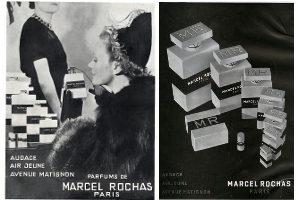 I love all the older Rochas perfumes, they were so outstanding even among their peers of the time. Ah, the wonders of oakmoss…sigh. Rochas is one of those houses that just seemed to do it right so often!